Berlin wall memorial, a watchtower in the inner area. 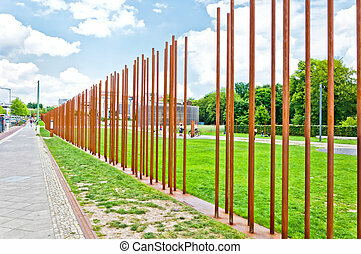 the gedenkstatte berliner mauer. 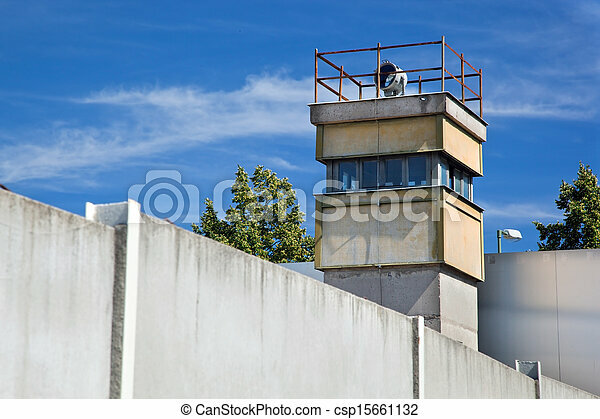 Berlin, Germany - June 10th, 2012: Low and wide angle view of a representation of a BT9 watchtower that stood erect in this spot of the Berlin wall between the years 1983-90 (replacing older models that stood there since 1962). 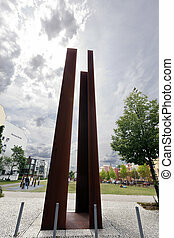 This tower is placed at the Berlin wall memorial at Bernauer strasse. On the building behind the tower there are photographs of this section of the wall through the years. In the distance, some people can be seen touring the site. 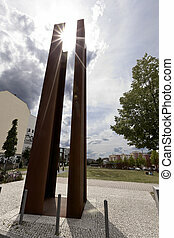 Berlin, Germany - June 9, 2013: memorial to Berlin Wall in Bernauer Strasse, on June 09, 2013. When Berlin was a divided city, the Berlin Wall erected in 1961 ran along this street. 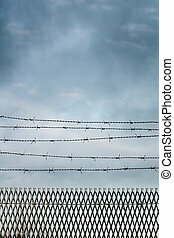 Berlin Wall, Berlin Germany. 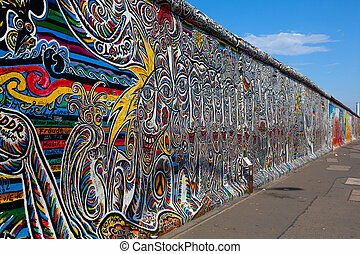 the largest outdoor art gallery in the world on a segment of the Berlin Wall. BERLIN - MAY 15: Part of the Berlin Wall with a 99 Percent' movement graffiti on May 15, 2013 in Berlin, Germany. Berlin Wall was a barrier constructed by the DDR that completely cut off West Berlin from surrounding East Germany and from East Berlin. 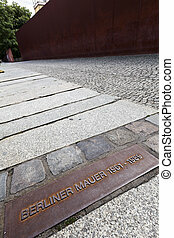 Wide angle tilted view of a metal relief depicting the years and location in which the Berlin Wall once stood. 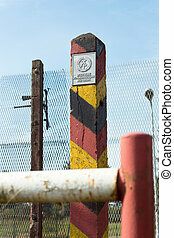 The Berlin Wall German: Berliner Mauer was a guarded concrete barrier that physically and ideologically divided Berlin from 1961 to 1989. 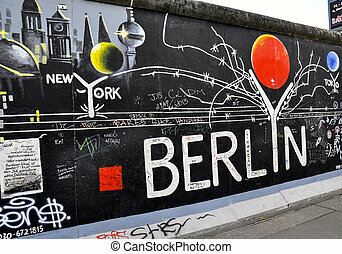 Constructed by the German Democratic Republic GDR, East Germany, starting on 13 August 1961, the Wall completely cut off by land West Berlin from surrounding East Germany and from East Berlin until government officials opened it in November 1989. Its demolition officially began on 13 June 1990 and was completed in 1992. 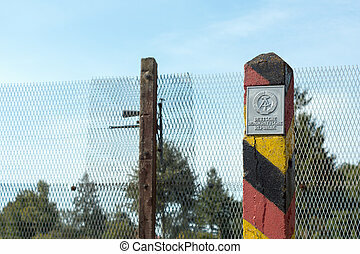 The barrier included guard towers placed along large concrete walls, which circumscribed a wide area later known as the `death strip` that contained anti-vehicle trenches, `fakir beds` and other defenses. 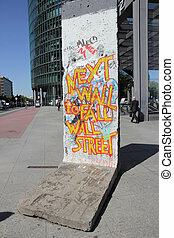 The Eastern Bloc claimed that the Wall was erected to protect its population from fascist elements conspiring to prevent the `will of the people` in building a socialist state in East Germany. 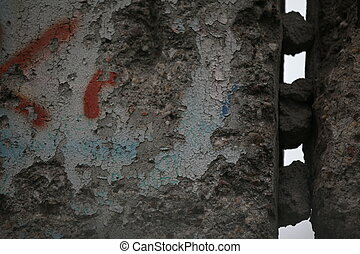 In practice, the Wall served to prevent the massive emigration and defection that had marked East Germany and the communist Eastern Bloc during the post-World War II period. 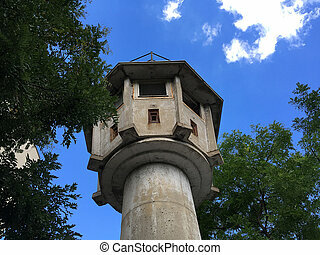 Former East German watchtower that is the last remaining of its kind. 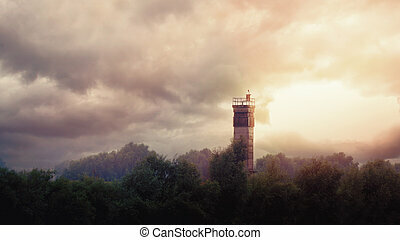 Image taken on a sunny day with some clouds in the sky and space for text.